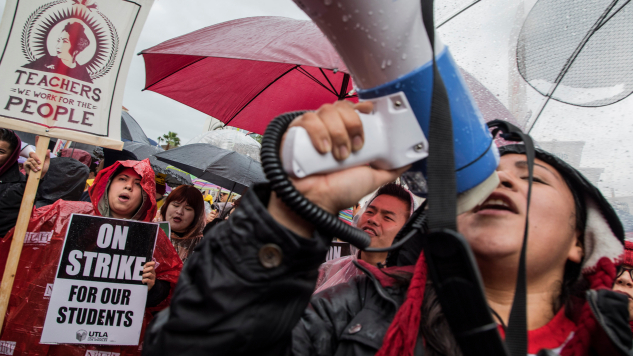 Thousands of teachers from the Los Angeles Unified School District (LAUSD) have taken to the street to picket, despite rainy weather. Many parents and students have accompanied them, brandishing umbrellas and signs of their own. The United Teachers of Los Angeles (UTLA), the city’s teachers union, organized the strike. In the most general sense, the strike is about devoting greater investment towards public education. Class size reduction means hiring more teachers. Hiring more teachers means more money. Other reasons for striking include a demand for higher salaries, increased accessibility to resources like school nurses and counselors for students, more librarians, greater attention to special-needs students and a call for a cap on charter schools in order to address the socioeconomic divides further enabled via the privatization of education. Out of 50 states, California ranks 43rd in terms of per-pupil expenditures. “So here we are on a rainy day in the richest country in the world, in the richest state in the country, in a state as blue as it can be, in a city rife with millionaires, where teachers have to go on strike to get the basics for our students,” UTLA President Alex Caputo-Pearl said, pumping up a group of enthusiastic educators outside John Marshall High School in the Los Feliz district of Los Angeles. Superintendent Austin Beutner says the present demands aren’t possible, but members of the UTLA are urging the school district to tap into $1.8 billion in reserves in order to fund more staff and increase teachers’ pay. What has been the impact of the strike? The school district has lost roughly $97 million throughout the course of the strike. This is because the state funds schools based on daily attendance, and attendance has plunged since the start of the protest. For example, on Thursday, only about 84,000 of the district’s 600,000 students attended class— a 37% decrease in attendance compared to Wednesday. Schools will remain open and continue serving meals during the strike. Before and after-school programs are continuing as normally scheduled.